Our day has been spent mostly on or near the banks of the Lot river. Leaving Villenueve sur Lot relatively early this morning our first stop was at Fumel, an attractive enough village but everything was closed so we had a wander around in the sun for a while before moving on. 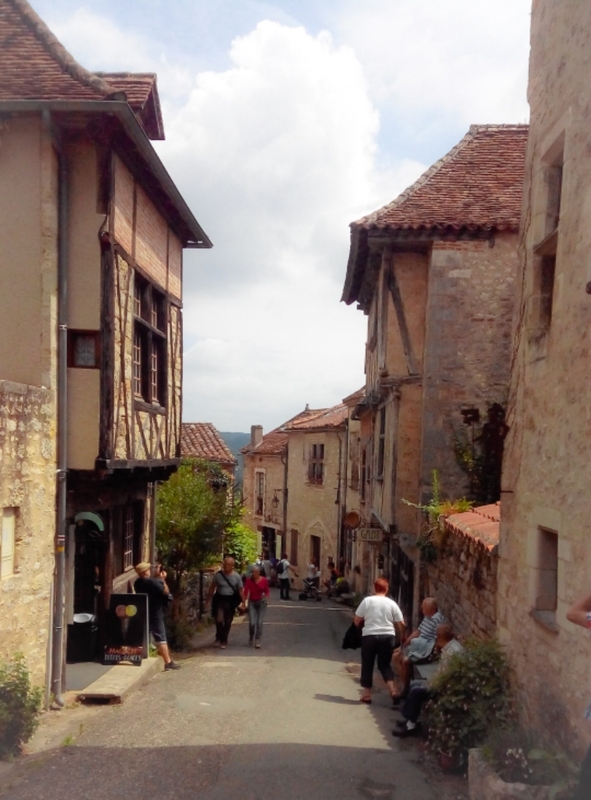 Next we stopped at Puy l’Eveque where an extra coffee was the order of the day before a very abbreviated stroll into the steep medieval old town. We decided to head on past Cahors, where we were booked for the night, so we could visit St Cirq Lapopie. This ancient village which tumbles down a steep face above the Lot river is probably the most touristy little place we have visited since Paris. The buildings are all half timbered (see picture) and it has a large rock outcrop practically in the village. Unfortunately it attracts bulk visitors and we had to park in a pay car park about a km away. My knees held up pretty well but I did not climb the outcrop. 30 degrees at times today but I must be getting used to it as I’ve not felt too hot. I guess I might notice the cold when I get home. We have just checked into a newish hotel on the outskirts of Cahors and plan to head into town for a stroll and some dinner after we’ve had a bit of a break. It’s tiring work being a tourist! We took the car part way into Cahors then parked it when we thought we were getting close. Unfortunately it proved to be a pretty spread out city and by the time we’d walked to the historic bridge and back to the city my knee was feeling like it had been working. 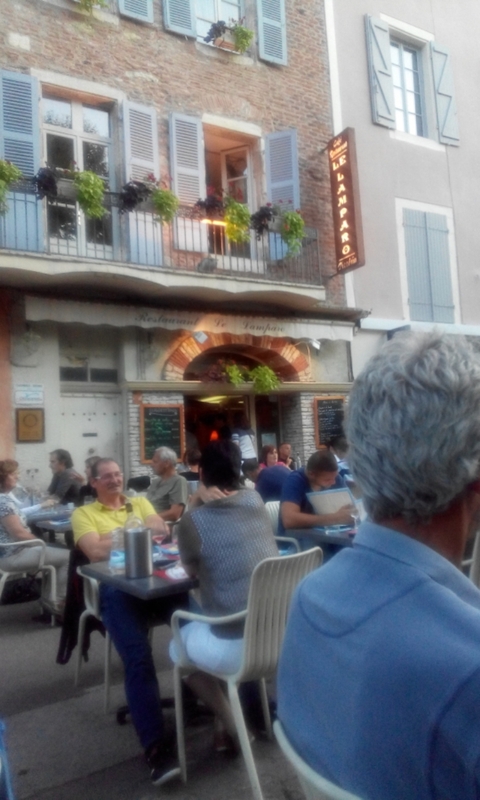 Fortunately we found an excellent restaurant (Le Lamparo above) where we spent a couple of hours over a three course meal with local wine. It’s almost 10pm now and we are just back to our room. The knee is still going well I’m pleased to say. Hi again, catching up on two days .What incredible old buildings! Then your more modern restaurant for a relaxing meal till 10pm! We wish! Glad to hear the knee is going well, but don’t overdo it! Best wishes. Hi Guys. We could have been mistaken for being in France as well today with our 20 deg temp and the same forecast for tomorrow. Hope you are not becoming too accustomed to the good life! I’m sure Ronas meal would out do your food any time. Cheers and beers. What super spots! Hope you’re using the pole for the down hill treks, Quilliam. It should relieve at least 20% pressure on your knee! Hot here today and tonight! I’ve just moved a ladybird on – she was was wandering across the screen!! !